Nikopoulou Iro (Athens, 1958). Painter, poet, prose writer. She studied at the School for Fine Arts and works and teaches Art in Public Education. Her first book: The Wayfarer’s Myth, Poetry, Athens, 1986. 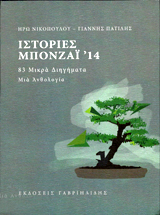 Her latest: In Greek: Riddle, (Gavriilides editions, short stories, 2013).